Kilranelagh Lodge is within walking distance of Kilranelagh graveyard, Ireland’s second oldest graveyard. Buried within these walls, is the remains of Sam Mcallister who fought alongside the famous Michael Dwyer, in the 1798 rebellion. McAllister is lauded for saving the life of Dwyer in the Derrynamuck ambush. Sadly, Mcallister lost his own life in this battle by deliberately running towards the crown forces who opened fire killing him. This selfless act allowed Michael Dwyer to escape and continue with the rebellion. 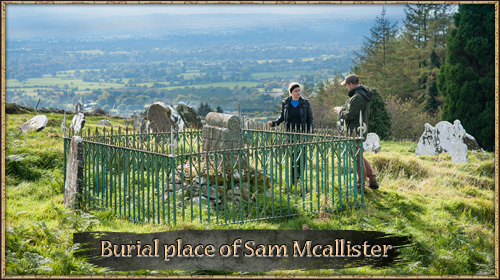 A statue commemorating the rebellion and depicting Sam McAllister was unveiled in nearby Baltinglass in 1904. Kilranelagh graveyard is also home to the Standing Stones. Local custom dictated the carrying of the coffin of the deceased person or rebel between the two standing stones, to ensure the deceased went straight to heaven. Aedh Ainmire, the 6th century High King of Ireland, who lost the Battle of Dun Blog and also lost his head as described in the Borama saga, is believed to be buried at this site. The standing stones have also been identified as the remaining orthostats of a prehistoric tomb. 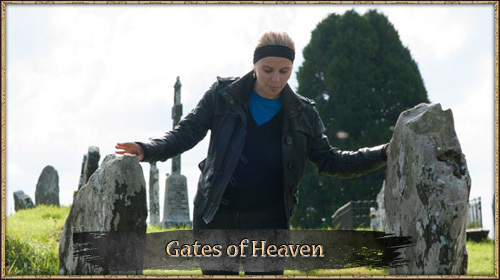 The standing stones are now known as the Gates of Heaven. It is believed that the Gates of Heaven may be the entrance to the Kings Tomb. This site plays a key part in the Kilranelagh Tribal Challenge. Saint Bridget’s Headstone is situated 500 meters from Kilranelagh Lodge and is easily accessible. 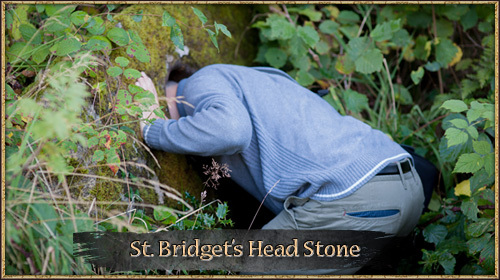 It is widely believed that St Bridget’s Headstone has the power to cure headaches. The large granite headstone stone has a perfect head size circle in its centre. To avail of the cure guests should place their head in the centre circle. 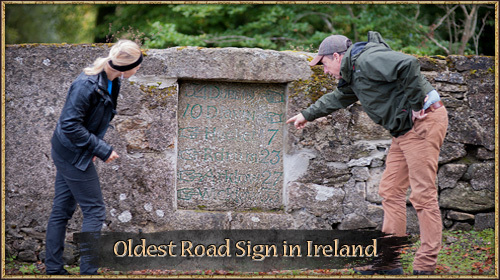 The 6th Century High King of Ireland, Aedh Ainmare, was thought to have been killed at this site. St Bridget’s Headstone and its location create an unrivalled reality theme to the Tribal Challenge. The White Stones of Aife,also known as The White Cows of Aife, consist of a large outcrop of white marble boulders situated directly opposite Kilranelagh lodge. The site is a listed battle site and features in recurring references to battles involving the overthrow of the Ui Mail tribe in the 6th and seventh century’s. Aifes importance as a early historical battle site makes for a uniquely different and fascinating visit with visitors gettinga real sense of adventure in the discovery of unique heritage and early Irish history. The Marriage place of Micheal Dwyer, the famous 1798 Rebel. Michael Dwyer married Mary Byrne on the 16th of October 1798. Their wedding was officiated and celebrated by Father John Murphy in Father Murphy’s church and parish house on the banks of Greens River. The ruins of Father Murphy’s house are within the grounds of Kilranelagh Lodge, situated in a beautiful indigenous eight acre woodland area overlooking a waterfall on Greens River just above Kilranlock. We have recently discovered a poem describing the location and revealing the intriguing story of the marriage of Micheal Dwyer to Mary Byrne. This location now forms a major part of our Tribal and Heritage challenge.